buy your UP Board, Squared & Core now! UP is a perfect single board computer solution for different domains and products like Robotics, Drone, Machine Vision, Smart Home, Education, Digital Signage, Intelligent Cars and Internet Of Things. The compatibility with Linux, Android, and all the Windows 10 distributions give you great flexibility, scalability and quick time to market. Start 'making' now! UP helps (professional) makers to create their products and be able to move UP to the next level: volume production. UP is powered by an Intel® Atom™ x5 Quad-Core 1.44/1.92Ghz 64-bit SoC (Cherry Trail) and HD 400 graphics (H.264, HEVC decoding, VP8 is supported), with 1GB/2GB/4GB RAM, 16GB/32GB/64GB eMMC storage, 40-pin GPIO expansion, 6x USB 2.0, USB 3.0 OTG, Ethernet, HDMI, MIPI-CSI/DSI, Intel® hardware security features and more on one board with the size of a credit card. 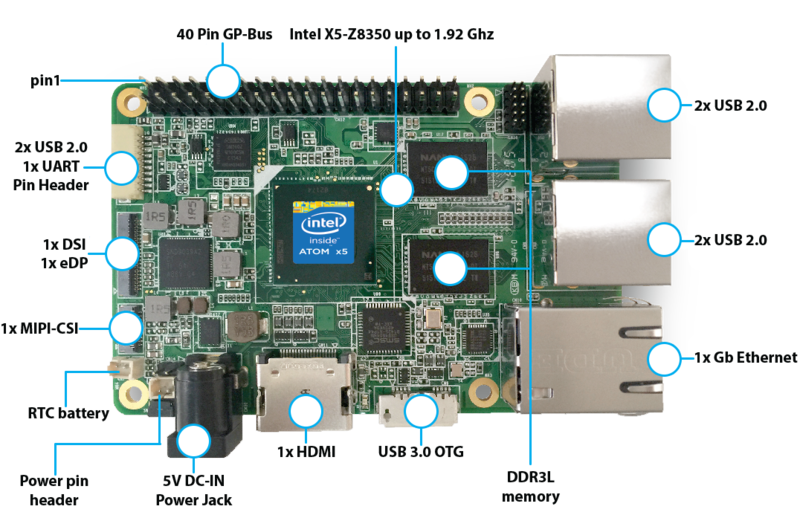 UP² (Squared) is powered by an Intel® Celeron™ or Pentium™ Apollo Lake Dual or Quad-Core 64-bit SoC and HD 500-series graphics (4K Codec Decode, H.264, HEVC decoding, VP8 is supported), with 2GB/4GB/8GB RAM, 16GB/32GB/64GB/128GB eMMC storage, 40-pin GPIO + 60-pin EXHAT expansion, 2x USB 2.0, 4x USB 3.0, Dual Ethernet, 1x HDMI, 1x DisplayPort, MIPI-CSI/DSI, Intel® AES New Instructions & Identity Protection Technology and more on one board. The UP is a platform designed for makers who intend to UPscale their prototyped ideas quickly into mass produced solutions. UP Board is a full credit card sized PC that is able to run a multitude of operating systems including full Windows 10, Windows 10 IoT Core, ubilinux, Yocto, Ubuntu, Phoenix OS, Android Lollipop and Brillo. High performance is guaranteed with the x86 Quad-Core Intel® Atom™ x5-Z8350 with Intel® HD 400 Graphics while maintaining a low power consumption of only 6 Watt. The 40-pin I/O connector, USB 3.0 OTG, Gigabit Ethernet, HDMI and more connections and features provide a perfect solution for various application purposes and products. Enterprise hardware security like Intel® AES New Instructions and Intel® Identity Protection Technology will give your product and data a faster and more affordable protection and greater security. To continue, please agree to our terms and conditions and click "Go to checkout".